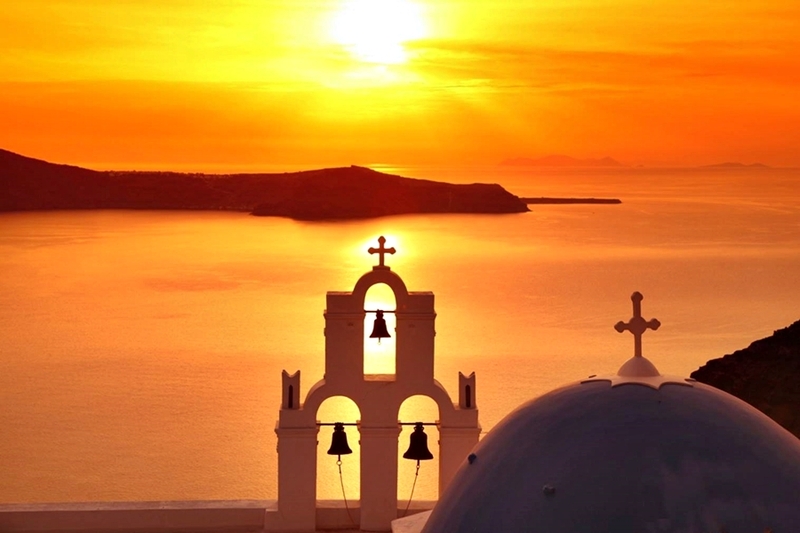 Considered one of the top romantic destinations in the world, the island of Santorini will amaze you with its sunset, gastronomy, boutique hotels, traditional architecture and lively atmosphere. Its stunning landscapes, including the volcano, caldera, sea cliffs, and blue sea dotted with islands make it a true gem in the Southern Mediterranean. This island is truly unique as it offers something for everyone, from visits to wineries and mysterious archeological sites to unknown hiking paths and unparalleled culinary traditions. Go on a wine tasting tour, buy quality local art, go on a hike, discover local cuisine, visit the museums or try your hand at water sports. 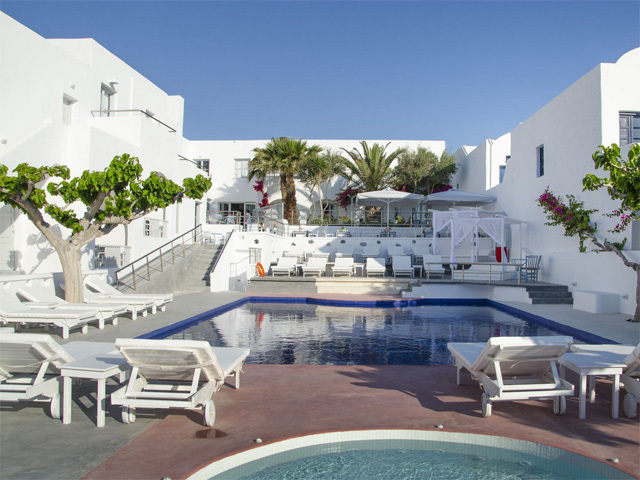 Santorini has some of the best boutique hotels and five-star properties in Greece, in addition to well-designed furnished apartments and cozy mid-range hotels. 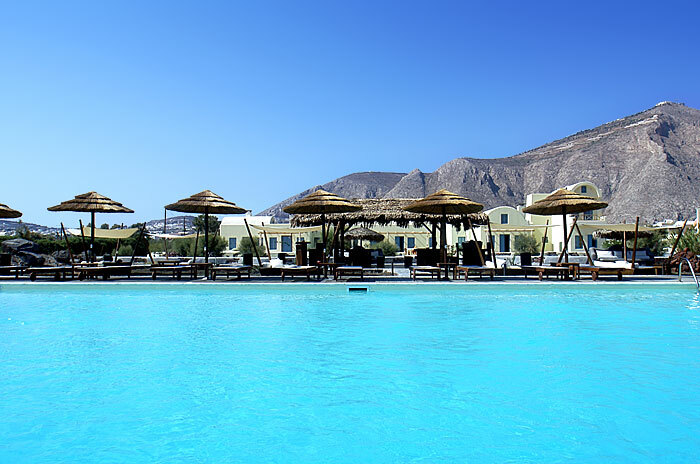 In this context, the Santorini hotels on our site can arrange a variety of trips, activities and excursions, so don’t hesitate to book through us. To illustrate, swimming near the island’s active volcano and the warm waters is a major attraction and features on many island tours. If you’re here mostly to swim and want something a bit quieter, away from mass tourism, head to Vlyhada and Perivolas on the southern side of the island. The many beaches, many of which boast unique black volcanic sand, are a magnet for visitors who at the end of the day flock to the cafes and bars to watch the sunset. After an excellent dinner in the many local restaurants, the island opens itself up to a vibrant nightlife, from dance clubs and jazz nights to Greek bouzouki. Very interesting is the collection of villages and communities beyond the main town of Thira (also known as Fira), each boasting its own atmosphere and landscape, and some more historically significant than others. The classy, artsy town of Oia has small upscale hotels and guesthouses, while its little port down a long staircase offers good food and a ride to the remote little island of Thirasia, also ideal for a hike and a good local meal by the sea. In the meantime, the ancient site of Akrotiri on the other side of the island boasts a Minoan settlement, unearthed from the ashes of the major volcanic eruption that took place some 3,600 years ago. History buffs should also visit the Archeological Museum in Thira, as well as the Museum of Prehistoric Thera which is well worth seeing. If you’re into a bit of more recent island history, visit the Lignos Folklore Museum in Kondochori. For wine enthusiasts, the Boutari Winery and Venetsanos Winery near Megalochori, as well as the Santo Winery in Pyrgos, will delight connoisseurs. If you’re more into beer, the Santorini Brewing Company won’t disappoint. As far as activities go, underwater lovers will rejoice to know that there are several certified scuba diving clubs. Sailing opportunities, sea kayaking, snorkeling and other seaside activities such as swimming in the island’s hot thermal springs are always on offer. Last but not least, land lovers will definitely enjoy the hikes, taking note that if you’re coming in mid-summer better hike early morning or at sunset. This is one island that will take your breath away. 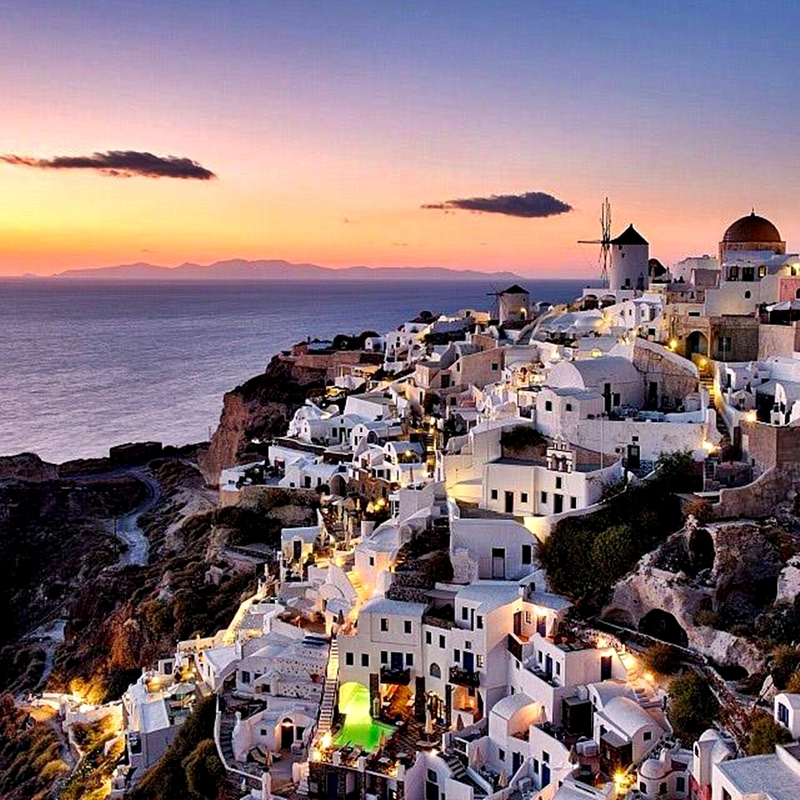 Santorini is one of the most know islands in all over the world due to the volcano that sleeps in the area. That is the place that any traveler wants to visit. If you are into romantic or adventurous vacations take a look at the hotels in the island. You are going to love the accommodation choices that you are going to have on this great island. You can choose a five star hotel or a traditional room under the rocks. The e-global travel agency offers you an online booking system, one of the most advanced that you are going to find and with witch you can make a room reservation from the safety of your home. There is an airport in Santorini so book the airtickets directly to the island or you can reach Santorini by ship from Piraeus. Do not forget to book the activities you are going to have from the safety of your home.